Maria Curie-Sklodowska University is the biggest public university in eastern Poland. It is situated in Lublin – an academic city of several cultures and traditions. The unique character of UMCS’s educational offer is achieved through its versatility manifested by 11 faculties where students obtain their education. UMCS has an established position in teaching science: natural sciences, mathematics or information technology have been enjoying wide interest for years. Nevertheless, liberal arts, modern languages and journalism are also strong at UMCS, making it stand out not only in Lublin, but also on the national level. We are educating as various professions as lawyers, economists and artists. Student’s life is centered around the Academic Culture Centre “Chatka Żaka”, offering different kinds of entertainment like performances, exhibitions, concerts. The University runs its own radio station – Akademickie Radio Centrum. Students who prefer physical exercises are welcome in the facilities of Physical Culture Centre (AOS), including a modern full-size swimming pool, weight lifting rooms, gyms, sports fields and tennis courts. An undisputed strength of Maria Curie-Sklodowska University is its campus – a nationally unique complex of educational buildings, student residence halls, clubs and cultural and sports facilities located in the city centre, next to the University. The university runs a two-semester system. Erasmus students can study at UMCS for one semester or for a full academic year. The first semester starts at the beginning of October and finishes by the end of January. There is a Christmas break in December. The examination session takes place at the end of January and lasts two weeks. The second semester starts in the middle of February and finishes in June with a break for Easter. The examination session starts in June and lasts about three weeks. There are also resit examination periods (in Polish: sesje poprawkowe) for those who did not pass their exams. A student who fails an exam during the first examination period after the winter semester has an opportunity to resit it in March (at the beginning of the second semester), but a student who did not pass an exam after the second semester will have a chance to pass it in September. Your teachers will inform you about the form of examinations at the beginning of the courses. Be prepared to pass oral or written exams. You should know that sometimes teachers allow volunteer students to take an exam earlier than it is planned within an examination period. In Polish, it is called “zerówka” and it is held before the official examination period begins. First-cycle studies – 3-year duration, having completed this type of studies, students receive the title of “licencjat” (the Bachelor’s degree) and can continue their education at master’s degree studies. Second-cycle studies – 1,5 to 2 years are available for graduates of first-cycle studies, having completed this type of studies students receive the title of “magister” (the Master’s degree). Long-cycle studies (First + second-cycle studies) – uniform Master’s degree studies – of 5 to 6-year duration; having completed this type of studies, students receive the title of “magister” (the Master’s degree) and can continue their education at doctoral studies. Third-cycle studies – doctoral degree programmes – usually last from 3 to 4 years and are available for graduates of Master’s degree studies, having completed this type of studies, students receive the title of “doctor” (the PhD degree). Maria Curie-Sklodowska University uses the standard grading system for Polish higher education institutions. The grading scale is from 5, being the highest, to 2, being the lowest, failing grade. The lowest passing grade is 3. Often the marks “+” and “-“ are added to the principal grades. The courses have various forms: lectures, practical classes, workshops, seminars, laboratory classes and practical placements. Depending on the study programme and type of course you will meet various assessment methods. You will probably be given marks for presentations, essays, dissertations, project works, active involvement and participation in classess during the semester as well as for examinations at the end of the semester or academic year. Some courses, especially those wich do not end with examinations, but which require compulsory attendence and a certain number of completed exercises and tasks, may be graded as pass or fail. Most of the faculty buildings and other university units such as the Rektorat building, the Main Library, Academic Cultural Centre “Chatka Żaka”, Polish Language and Culture Centre for Polish People from Abroad and Foreigners as well as the student residence halls and Physical Culture centre are located on the main university campus, around or near Maria Curie-Sklodowska Square. The Faculty of Political Science, its dean’s office and the Institute of Psychology are situated in the heart of Lublin – they are adjacent to Litewski Square. 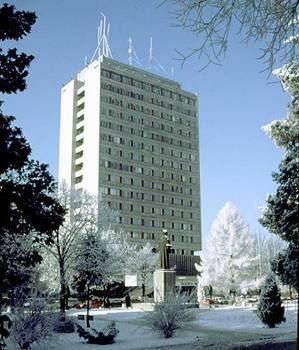 The building of the Faculty of Pedagogy and Psychology, or more exactly its dean’s office and the Institute of Pedagogy, is located at Narutowicza Street 12, also in the centre of the city. There is another small university campus in the western part of the city at Al. Kraśnicka. It is home to the Faculty of Arts and the Faculty of Earth Sciences and Spatial Management. 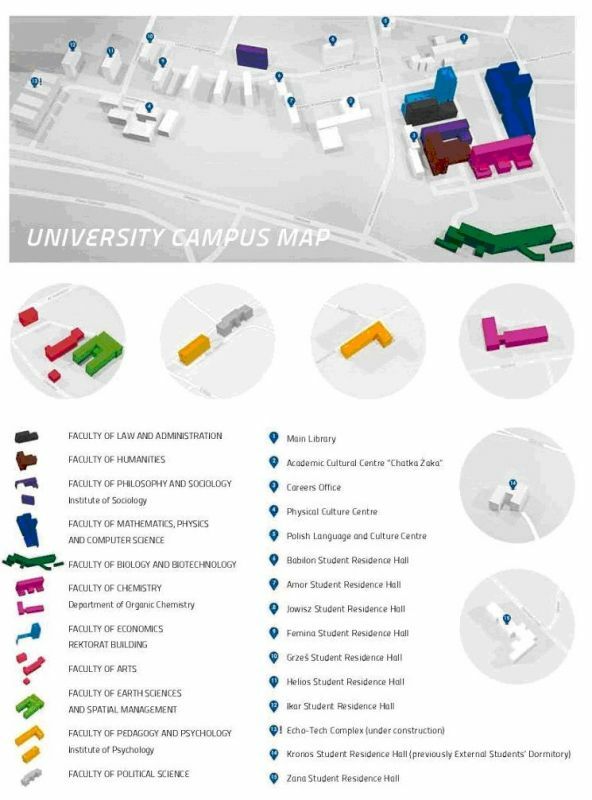 Source: The abovegraphics is taken from ‘Erasmus Guide for International Students’.